This is certainly true of the big questions around how to do political theory. But it also applies to the more mundane aspects of being a graduate political theory student. There is a lingering assumption that students will just muddle their way through three or four years of lonely research, and then *puff*, a fully-formed political theorist will appear, a copy of Hobbes in one hand and a CV in the other, ready to do battle with the modern academic job market. This is obviously a silly way to organise the professional development of a discipline’s next generation. But a more nefarious aspect of this, is that the informal networks through which students eventually do learn about these things, are much easier to access for privileged students from big-name universities. One motivation for making this kind of knowledge accessible online, is that it can help democratise that knowledge. The following tips are only suggestions. They should not be taken as necessary, and certainly not sufficient, steps for getting a job after the PhD! They are instead supposed to highlight some of the more everyday aspects that students don’t always know about. Political Theory Email List, Association for Political Thought, Association for Political Theory, The Republic of Letters, ASPP – Association of Social and Political Thought, American Society for Political and Legal Philosophy, and ECPR Political Theory Standing Group. Once you’ve realised that conferences rarely result in self-improvement and seem to exist for entirely separate reasons, they start to make much more sense. One of these other reasons, is the much dreaded networking. Students are often uncomfortable with this aspect of graduate life. Sometimes this because of an entirely justified dislike for the unedifying forms networking can take. But sometimes it is because students think that networking undermines the purity of disseminating your research. This is a misguided view. Misguided, because there is no magical, morally neutral, meritocratic process, whereby you put your articles ‘out there’ and you will then, somehow, be noticed, cited and invited. All of these practices are driven to a much larger extent than most graduate students think by who people have happened to meet at conferences and seminars. That is an unfortunate feature of our discipline, but you are not (yet) in a position to change it. That means that going to conferences and making some effort to meet people is a necessary part of the graduate political theory experience. One (positive) way to think about this, is that almost all jobs require networking of some kind. At least in political theory, networking means spending time with generally interesting left-wing people (which is how I like to spend my time anyway!). Another, is that if you are worried about the legitimacy of your project, going to conferences can also be a very rewarding way to start to build up links with academics and other graduate students who are interested in similar questions and approaches to you. It can also be a very welcome and fun distraction from just starring at your thesis – and you don’t have to feel bad about needing that from time to time! But you should only go to nearly everything. Presenting at too many conferences can easily start to distract you from the actually getting the PhD done. One mistake I made was assuming that writing things on the topic of my PhD was the same thing as writing my PhD. You should therefore present papers that are as close as possible to actual chapters (without that fact, however, being obvious to your audience). As a general rule, I would perhaps suggest going to four conferences a year, and presenting at two of those. One of the more frustrating things in political theory is hearing about a student’s work, googling them, and then only finding an outdated LinkedIn page. Older academics at least have a generational excuse for having a bad web presence, but I’m constantly surprised by how few graduate students have put much thought into this. And it is really not very hard. Setting up an academia.edu page, or a student profile on your department’s website, does not take very long at all. A personal website does involve a little more effort, but has the advantage that it stays constant as you move to different departments and gives you more freedom than sites like academia.edu. I think students are sometimes a little embarrassed that this might smack of self-promotion, but the fact is that people need to find out about your work somehow. If an academic wants to invite an upcoming scholar who works on 19th century feminist thought in France to their conference, they should be able to google those terms and find that you are just the person they were looking for. You’d be surprised how many people might come across your work this way. Additionally, I think you have a responsibility to make your work as easily and as freely available as possible. Despite the success of sites like Sci-Hub and Library Genesis, academic articles and books are still inaccessible to too many people. That means you should contribute to circumventing the intellectual property claims of publishers wherever possible. Making your work available on your personal site (or academia.edu) is one, good, way to do this. This is one of those rare things in graduate academic life that is relatively easy to do, has several advantages and only a few potential downsides. The advantages are that you get (1) a free book, (2) a chance to practice your academic writing, (3) a mini-publication, and (4) further exposure so that more people hear about you. One downside is the time it takes to write it. But two weeks (one to read the book and one to write the review) is not a huge chunk out of the 150+ weeks of your PhD. And if you pick a book on your PhD topic that you were planning to read anyway, then it really is not much more time than you were going to invest anyway. 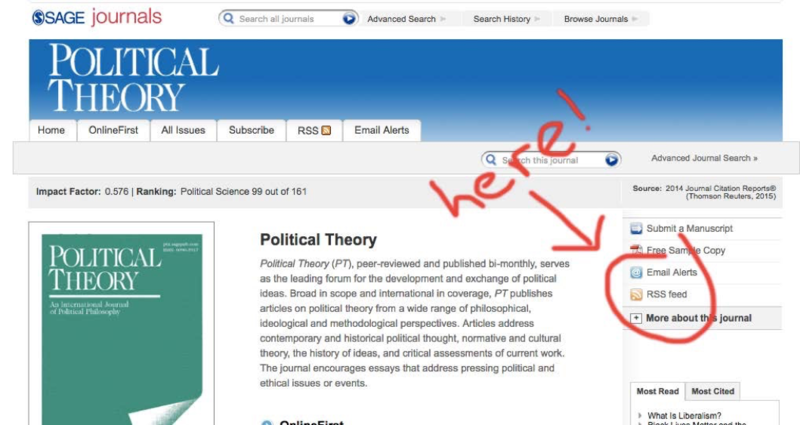 There are several political theory journals that are good potential options for a review, such as the European Journal of Political Theory and Res Publica. There are also more generalist politics journals like the Political Studies Review that you could try. Normally, the best thing to do is to email the editor or book reviews editor (if they have one), briefly outlining your suitability and attaching your CV. Make sure you do this before buying the book or writing the review, since you don’t want to waste your money or time. Book reviews look good accompanying your main publications, but remember they are not nearly as important as getting a peer-reviewed article. If you happen to be at a University in a cold, wet, and grey country (i.e. England) an exchange semester is the perfect opportunity to temporarily escape to somewhere with better weather and better food (i.e. everywhere else). More seriously, it’s an opportunity to get to know a new set of political theorists (and perhaps even style of political theory) in another department or country. That not only exposes you to new ideas, but means that there’s a bigger group of theorists who know about you and your work. It’s also a particularly useful if your main supervisor doesn’t work exactly on your topic, since you can find someone who does. They are then also in a position to be one of your references. And if your university isn’t particularly known for political theory, it’s also chance to go somewhere that is, and add it to your CV. If you play your cards right you can even get funding to cover your stay and suspend your main scholarship, and thereby extend the overall time you have funding for (making sure you still have money to eat in that crucial final year). My least favourite part of political theory, by some distance, is the proportion of my working life that I have to spend trying – and inevitably failing – to listen to academics who thinks that the summit of academic rigour is to subject an audience to the display of them reading out their DEEP THOUGHTS in an unbroken monotone. Few things have brought me closer to despair at the human condition. Many graduate students see this practice in action and, against every human instinct, think that this is the accepted way to do it and begin to copy it themselves. I understand that presentations are nerve-wracking, especially early on, and there is a temptation to think that hiding behind a thick pile of paper will shield you from the audience. But ultimately you’re the one who loses out when the audience fails to engage with what you say and silently resents you for having wasted their Wednesday afternoon. But it doesn’t have to be this way! Graduate political theorists, you can be the change you want to see in the world and break this cycle! Taking a few extra hours to properly prepare the presentation is worth it. If you can memorise it and deliver it without reading it out that’s great. But if you find that too daunting, you should at least make an effort to work on your delivery style. Even basic things like looking up regularly, making eye contact, and pausing to make an occasional comment, can make a big difference. And you should definitely prepare an accompanying hand-out or a PowerPoint. Some theorists are a little snobby about them. But really these are just tools that can help the audience to better follow your argument (PowerPoint can also, like any tool, be used for evil). At some point you should also practice with your fellow graduate students and tell them to give you (honest) feedback on your style and not just your content. No-one expects you to be able to get to a point where you can effortlessly break into song and impersonations of dead philosophers. But with some investment and practice, I think nearly all political theory students are capable of giving a decent presentation. And your audience will appreciate the effort. In closing, a final piece of advice, remember that though your political theory PhD is of course one of the most important things you’ll ever do, it helps to keep it in perspective. Thanks to David Axelson, Udit Bhatia, Johannes Kniess, Sabrina Martin, Tom Parr, and Andrew Walton for their helpful suggestions. Bruno Leipold is a political theorist and historian of political thought doing his PhD at the University of Oxford. His research interests are in anarchism, Marxism and republicanism. The Future of Disabilities: Will prenatal testing transform bad brute luck into a case of expensive tastes? P.s. additional tips very welcome in the comments! Thanks Tom! I completely agree with whats wrong with Academia.edu. I had until now mostly thought of it as problematic, though all things considered still ok. But I hadn’t seen the movement to #deleteAcademiaEdu. Not sure what I think now. I suppose I think the public commenting system on draft papers is quite useful and is not replicated anywhere else (that I know of). They also seemed to have mostly failed to properly monetise it. But perhaps thats not far off, and we should collectively get out before they figure out a way to do so. There’s a lot of generalised good advice for many fields outside political theory, I find! Yep they definitely apply beyond just political theory. I wouldn’t know the specific blogs/pages/journals, but hopefully there are some blog posts that do something similar for other disciplines. Agreed. I think it makes sense to think of at least 1-2 chapters in that way. Its a bit of shame to have to do so, and I’m not sure I like the trend away from writing the PhD as a book. But on the other hand, you really do now need at least one article if you want an academic job after the PhD. I thought this was spot on. Especially with regards to Power Point. It never made sense to me why theorist / philosophers don’t avail themselves to technology that will help the audience stay awake. And, interestingly, my advisors have told me they just do not like Power Point presentations. They prefer people to read from their work directly. Also I’m “stealing” the handout idea for the Western Political Science Conference in Vancouver next year.